There are many who argue that collecting money to allow people to hold/pose with animals in zoos and other establishments is an unethical act. I have a divided opinion on this. Major zoos which advertise such things do collect the money for conservation purposes. I also feel that allowing such interactions would help people understand the animals further thus increasing their love for them. I have tried using this line with Vidhya whenever there is an opportunity to hold snakes, but she has been relentless in her campaign of not allowing me to pose with snakes. 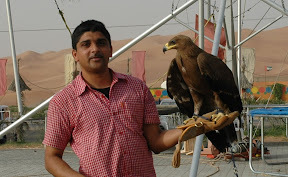 I am posting below all our “encounters” in different parts of the world. I love animals, i love photographing them. But the best thing is to be close to them and feel their wildness. The next few photos are from our Singapore trip (which i am yet to write about). 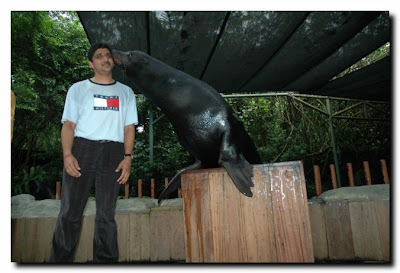 The first one is a with a California Seal taken after the “Splash Show” at the Singapore Zoo. For some reason, i was scared and my expression in the photo turned out to be a little silly! 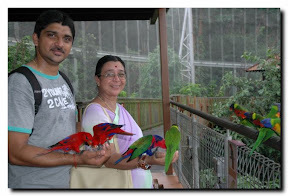 That’s me and my mom feeding the lories at the “Lory Loft” at the Jurong Bird Park. This was an excellent enclosure where the birds (hundreds of them) were flying around freely and you could feed them (some liquid). The ones Vidhya was feeding were more interested in her watch rather than the drink. 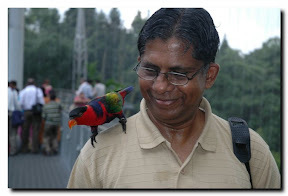 One even landed on my dad’s shoulder and he was more than happy to accommodate it. The next photo is from Dubai. When you go for a Desert Safari which includes dune-bashing, your starting point would be a place where people can watch many “native” animals and interact with them. Unfortunately Vidhya’s cousin, who was taking the photographs, took some time to understand the nuancies of a Digital SLR and many photos didn’t turn out ok. But, he has improved a lot now and he is as good as any other amateur i know. Thailand was one of the best vacation spots i have been to. We spent a month there and we had lot of fun. The photos are from a place called “Safari World” which is around an hours drive from Bangkok and a place in Pattaya called “Crocodile Park”. 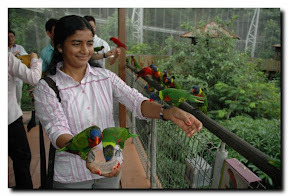 Like the bird in Jurong Bird park, this one too was very interested in the watch Vidhya was wearing. 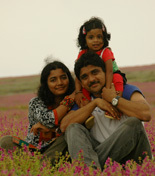 The one below is called our “Family Snap” by my dad! The Orangutans were extremely friendly, sometime too friendly to feel comfortable. The biggest tiger i have ever seen, it was trained to let out a huge roar whenever someone sits next to it for a photograph. The bear looks like it is showing the namaste sign, but it is actually holding a banana in its hands. Vidhya at her bravest! Don’t know what came over her, she readily volunteered to go over and take photographs with the elephant. Only the first photograph was part of the “posing plan”. The second and the third were not informed to us at all and Vidhya, though appearing to be smiling” was shaking for quite some time after. The elephant, without any warning, lifted her with its trunk and Vidhya had to request the mahout to ask the elephant to put her down. Saved the best for the last. The photos below seem to unnerve anyone who sees it, even us! Don’t know whether , given an option, we would pose once again with a croccodile. Next story Flight of fancy or was i on it ?